This is my Princess Cadence costume that I made for myself. I have worn it to a couple of conventions. 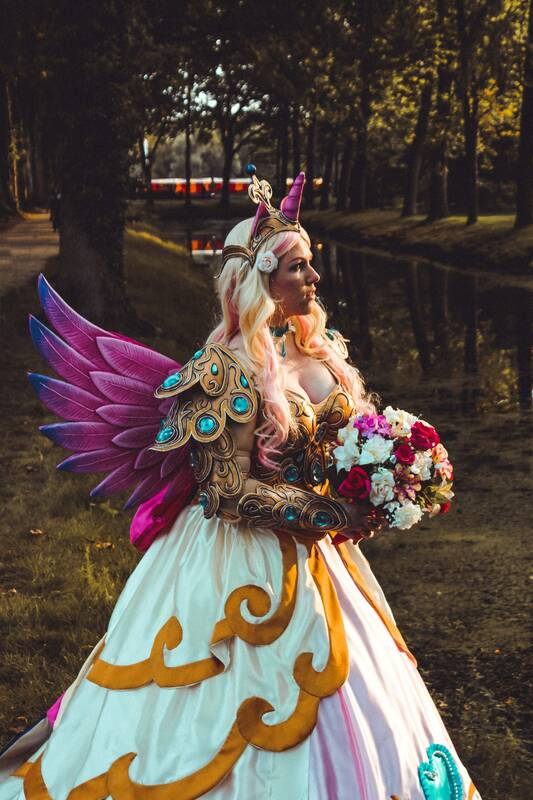 I made this costume with much love and care and I spent many hours working the Worbla for the armor pieces, handsewing all the golden details on the dress and to create a fully steelboned corset for this costume. The wings are mounted on a iron wire frame, and can be shoved into the corset at the back. So they sit firmly! As for size. I was aprox a EU size 42-44 when I made this costume, and I'm 170 cm tall. The armor closes in the back with lacing, so it is a bit adjustable. The corset of course, also laces, so this is adjustable as well. With this costume I won prices in several contests. It won first place at the Dortex design award in 2015, it won special mention in the Tsunacon cosplay contest in 2015 and it won the price for best cosplay at Elfia 2015. So it's an award winning costume! All the armor pieces are made with a thermoplastic called 'Worbla's Finest Art'. This is a hard and durable material, so the armor is quite sturdy. The pieces were all made by hand, after my own drawn costume design and patterns. The details on the armor are carefully sculpted and the gems were casted by me, using crystal clear resin. The wings are made with lightweight foam. The paint has some cracks in it, but really not that much. The wings still look absolutely magical and can be worn so many times in the future! Lots of hours went into creating this elegant costume. Of course I know I can't ask the price for all the hours spent on this costume, because it is already used. That's why I came up with this special price! For this price, this beautiful, elegant armored princess costume can be yours! I'm sure you can still get a lot of wear out of this outfit! It would also be super beautiful for fantasy themed photoshootings. The wings are too big to ship. If you want the wings, it's only possible if you can pick up the costume. I'm located in the south of the Netherlands. I can also fold the wings to make them fit into a box, but this means you will have to get the iron wire into the right shape again after you receive it. If this is no problem for you, please let me know, and I can ship the costume with the wings. The price of this listing is for the costume including the wings (so, folded wings). I sincerely hope my lovely Cadence will find a new loving home! And if you know someone else who might be interested, always feel free to share this listing!